What in life is more important than being loved by someone? Nothing really. Life as we know is full of turns and twists that we never expect. Sometimes, in life we have to let things go while sometimes it is the other way around and things are painful both the ways. 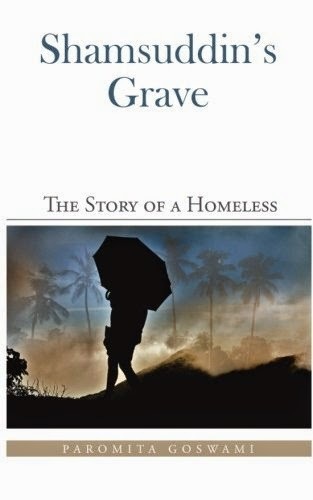 I have just concluded reading Shamsuddin's Grave : The Story Of A Homeless, debut novel by Paromita Goswami. The novel talks a lot about life both in general and particular. The story revolves around Shamsuddin and Latika, other important characters in the story are Snehlata, Debjyoti, Nayanmoni amongst others. The story is set in the early 2000's of Guwahati and influenced by the period when Bangladesh separated from Pakistan to form an independent country. The story majorly narrates the plight of people who were termed as illegal migrants of Bangladesh in India and Shamsuddin was one of them. The story briefly narrates the reasons why Shamsuddin had to leave his family back in village and head to a city like Guwahati and how he manages to survive, the hardships faced by him and the pain he goes through when being away from the family. When in Guwahati and after being disowned by several people, Shamsuddin finds his abode at Snehlata's house. Snehlata was from a Hindu family, so she herself had taken a huge step to let him stay at his place and in return he did petty jobs for her. Shamsuddin called her Mami (aunt) and she considered him not less than a son. Then Latika, Snehlata's niece, is introduced in the story and she shares equal importance in the story as Shamsuddin, she moves to Guwahati along with her dad and starts working with an NGO, which helps the locals in their day to day life. Snehlata introduces Shamsuddin to Latika and he considers Latika her elder sister, he helps Latika in her work, whenever and wherever required, as she was new in the area. Latika easily relates to Shamsuddin's story as she has also been through a similar phase, she was married to the person she loved but due to differences they had to put an end to their marital life. While working at NGO, she falls in love with Debjyoti and when all her doubts about Debjyoti are cleared and his assurance they both agree to marry and start over again. The story also focuses on problems in this part of the country such as human trafficking, illiteracy, natural calamities and inadequate human rights because of lack of adequate documents proving them official residents of India. Overall, the story is about several people living their individual lives and yet entangled to each other in some way or the other. I, personally, found certain sections of story repetitive but would recommend this book to anyone who is interested in reading contemporary fiction. The book has some grammatical and spelling errors, I am sure that these mistakes would be corrected in the next edition. Nice Article, Many people are not aware of publishing books and their reach.. Publishing books will double their reach as well as revenue. I also own a book publishing company and many clients are happy with their reach.